So it turns out that the first film about Paul didn't come out until 1910 or thereabouts when two different Western European silent film titles were circulating, both of which were about St. Paul. But there - and granted it is quite a long way down the road - the similarities started to end. The one I've known about for a long time was Milano films' 1910 San Paolo (Dramma Biblico), released in the UK as The Life of St. Paul. It was directed by Giuseppe De Liguoro, and according to the BFI archive Rodolfo Kanzler from Adolfo Padovan;sscript. As De Liguoro also took the leading role, it seems churlish not to mention the only other person credited, set designer Sandro Properzi. It ran to 453ft and there's a little bit more about it on p.114 of Giorgio Bertellini's "Italian Silent Cinema". DRAMA. Biblical. Scenes from the life of St Paul the Apostle. The archive holds several versions: Paul, a merchant in Tarsus, hears of a Christian gathering in a pine forest. With a group of followers he attacks the Christians: Jacob the Younger is dragged away to be stoned. On the road to Damascus, Paul is struck blind and hears the word of the Lord asking why he persecutes Him. He is converted to Christianity and his sight restored. Years later Paul enters the Christian catacombs on the Via Appia. He converts Nero's slave girl and a Roman soldier. Paul and the Christians watch Rome burning. They emerge from the catacombs to be arrested by Roman soldiers (453ft). St. Paul is led by Roman soldiers to an execution site. He is made to kneel. [The execution is not shown]. Pilgrims bring flowers and palm leaves to the site (48ft). Note: The Archive also has DER HEILIGE PAULUS (75ft Joye 1925) dated 1910 and consisting entirely of German intertitles. 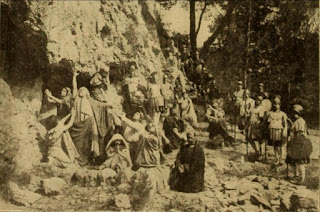 St. Paul and the Centurion (written"Centurian" more than once in Moving Picture World) was produced by Charles Urban's French company Urban-Eclipse, and distributed in the US by George Kleine. This one doesn't appear at all on the BFI site, but it does appear on the AFI site and on IMDb. There doesn't seem to be any record of a French title, however. 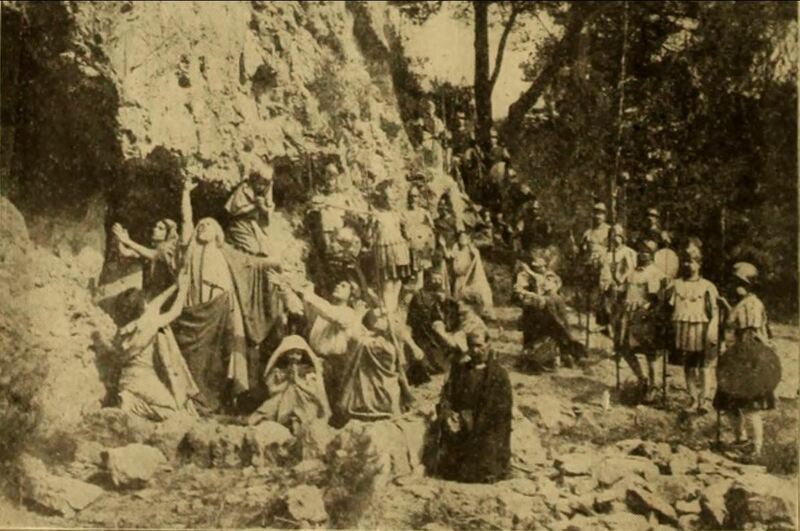 By this point Kleine was also starting to distribute Italian films as well as French but the AFI lists this as French, as does Jon Solomon ("Ancient World in the Cinema", p.7, though it lists it as 1911). An advert in Moving Picture World featuring the above image declines to mention the film's country of origin. An illuminating excerpt from Anthony R. Guneratne's "Shakespeare, Film Studies, and the Visual Cultures of Modernity" (p.141) and an entry from "The Oxford History of World Cinema" detail a little of Kleins involvement in the Italian industry seems to clarify that whilst Kleine distributed Cines and Ambrosio product, he was not involved with Milano, so all things here point towards this being two separate films. It's noticeable also that at 955ft this film is over twice as long as the Italian one above. In addition to the above picture there's also a good summary from a July 1910 edition of Moving Picture World. Metella, daughter of the Centurion Vicinius, loves one of her lather's slaves, Caius by name. This youth is a Christian and in the habit of frequently visiting the meetings held by them in the hills outside the city walls. Paul has gathered about him a small body of the faithful and preaches to them often in this secluded part of the forest. Metella, encouraged by her natural curiosity as to her sweetheart's secret excursions, one day follows him and learns her first lessons in Christianity. She leaves her hiding place and hastens to her father's palace where she finds Vicinius, her stern parent, in great rage because Caius is absent from his task. Vicinius now orders the slaves to take Caius to a nearby woods and there flog him. After the cruel chastisement Caius is left lying alone in the forest where soon after Metella finds him. She assists her sweetheart to the camp of his friends where she is so impressed by their lives that she accepts the belief and is baptized. When Caius has sufficiently recovered from his punishment he returns to his master and dutifully takes up his work in the household. Soon Vicinius, the Centurion, receives orders from Nero to arrest all the Christians who have been meeting in the hills outside the city. The soldiers are now called together and move upon the Apostle and his little band of followers. Although warned in due season, Paul refuses to flee, but engages in prayer while awaiting the arrival of Vicinius and his soldiers. Caius and Metella join their Christian friends, fully expecting to be imprisoned with them. When the attack is made upon the unarmed worshipers they are astounded to see the soldiers stop with their weapons suspended while they listen to the divine words. Gradually the swords and spears are lowered and the entire company with their leader drop to their knees. Whilst it's not impossible that these two synopses are just very different takes on the same film, again it seems likely that they are separate. Du persécuteur de chrétiens à Tarse (la lapida-tion d’Étienne) au martyre sous Néron après l’incendie deRome. Tourné dans la banlieue de Milan sur un scénario de l’écrivain Adolfo Padovan. The persecutor of Christians from Tarsus (the stoning of Stephen) to the martyrdom under Nero after the fire of Rome. Shot in the suburbs of Milan from a scenario by writer Adolfo Padovan (translation mine). So in the end it turns out that after 15 years of silence, the first two films about St. Paul (one of which came in two parts) were released, in America at least, just 5 months apart. Over the next few years films starring Paul would be released at the rate of at least one a year. Yet over a hundred years later we're still awaiting his big-screen, talking film debut.